I have not been reading books this year, except for those that I can read online, so I have an embarrassing backlog of books I have agreed to review and haven’t…yet. Fred First’s weblog was the inspiration for us to move to Floyd, Virginia. When he decided to self-publish selections from it as a book, we cheered him on. I had recently published my own book and knew it would be an adventure from which he would derive great benefit. Fred is now an experienced author with many book signings under his belt and his second edition of Slow Road Home is gaining acceptance with every passing month. I thought it might be appropriate to share my views on why this satisfying book should be read and given to your friends who ask what country life is like. There is an old saying that when the student is ready, the teacher will appear. In Fred First’s case, when he was ready to learn new lessons, he let Nature be his teacher. What he discovered about himself and his connection to his new home in the Blue Ridge Mountains will strike a familiar chord in everyone who has reached the point in life where our goals leave us unfulfilled. In Fred’s book, Slow Road Home, he discusses finding himself with no purpose in life after he left his position as Physical Therapist. His wife, Ann, had a job and was supporting them both, and he faced the challenge that many face in these changing times, that of creating an existence which includes a means of earning a living and at the same time discovering a worthwhile purpose. It becomes apparent as you read this fascinating book, that Fred develops a philosophy for his life as he discovers himself. It is an account of how he set out to find wonder and meaning in the myriad details of life in his valley and in the long string of apparently random events that led them to this place they call, "Here’s Home". His weblog journal, Fragments from Floyd, becomes a tapestry of his days, chronicling his angsts, his sometimes humorous efforts to overcome them, and his epiphanies. He applies his considerable analytical abilities to the problems he faces, his discoveries about life in the valley along Goose Creek and the bliss he finds observing the infinite details of life on a calm summer day. He takes us through several turning of the seasons, the loss of a beloved canine companion, and the tenderly funny incidents that make up married life on Goose Creek. At the very least, this book could be considered a record of his love for the place he and Ann call home. For the rest of us, the greatest value in Fred’s book may lie in the example he sets in so many ways of observing life closely, working to understand what he has observed, while discovering in himself the strength to persevere and share his discoveries with others. Inspiring, evocative, and moving, with many moments of dry humor. This book satisfies in many ways. 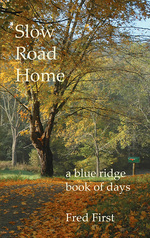 This entry was posted in Books and tagged Blue Ridge Mountains, Book Review, Floyd Virginia, Fred First, Goose Creek, self-doscovery, Slow Road Home. Bookmark the permalink.